Four massive caldera-forming eruptions and 200,000 years later, the island of Santorini takes its modern and familiar shape. The pioneers of NAU in Greece have had the opportunity to observe and research first hand the most recent of these eruptions, and possibly the most significant: the Minoan. We have scaled the caldera rim at Cape Plaka, trekked to the top of Mt. Profitias Illias, hiked the entire northern region of the island to Oia, and explored the Akrotiri ruins just to get a glimpse into the past. When the entire island of Thera had been diligently and meticulously observed, we left to Nea Kameni, the resurgent shield volcano in the center of the caldera to explore some more. When I think about volcanic eruptions, I picture overbearing darkness, flowing lava, falling ash and shaking ground. What I don’t picture is a volcano creating its own weather. However unlikely it may seem, this phenomena holds true for the Minoan eruption here on Santorini. During the Minoan eruption, volcanic weather may have helped shape deposits as well as creating other hazards associated with volcanic eruptions. Greek literature is full of heroes: Achilles, Odysseus, and Zorba, just to name a few. I must admit that I initially signed up for NAU in Greece not for the opportunity to study geology, but for the chance to see and live in the land that these heroes call home. More than anything though, I came for the stories I would one day tell; I promised myself to find my muse, seize every adventure, and write every bit of it down in my travel journal. After three weeks here though, the pages of my travel journal are sparse, and instead my geological field notebook lays filled to the brim with discoveries. Volcanic gases are widely understood to be one of the more dangerous aspects of active volcanoes. Where they can certainly be hazardous to your health or even deadly, the volcanic gases also have a more positive side that never seems to get enough light. Hot springs pop up all around the world near active volcanoes, and gases emitted by volcanic vents provide useful scientific opportunities. Such opportunities should be taken, though cautiously, because these gases don’t have a bad reputation for no reason. Between January 2011 and February 2012, Santorini was enveloped by crisis. An average of 50 earthquakes a day constantly shook the islands and terrified locals. Santorini residents refer to the 14 months of earthquakes as the Crisis Period and were relieved when the seismic activity finally ceased. But what many of the locals didn’t realize was that deep below the surface of the water the caldera floor was sending a message: the volcano is recharging. A Period of Unrest? About What? “Is it safe for me to live on this island? Do I have time to sell my house?” Irini, a local worker in a shop of handmade goods, inquired to me and a classmate of mine after we told her our purpose for being on this island for three weeks. We assured her that she was fine for a long while, but there is no denying that Santorini is an island of unrest. Volcanic unrest, that is. There is so much volcanic activity within the caldera that there was a period of crisis that occurred between for fourteen months from the years 2011 to 2012. Here is the interesting part: a majority of inhabitants on Santorini don’t even know why this period was considered a crisis. Living life on the edge is not always just a metaphor. The people of Santorini take this saying to a whole new level as their cities are built upon the caldera rim. This provides for some amazing views and stunning landscapes but it is also subject to devastating mass wasting. A resistant metamorphic rock at the base of stacks of volcanic rocks creates an intense slip surface. These mass wasting events take place and will continue to occur because of the specific type of volcanic rock and their locations throughout the island. Our class has been in awe of Santorini ever since the first time we laid eyes on this breathtaking Mediterranean getaway that is considered the most beautiful island in all of Europe. Most people that travel to Santorini also enjoy it’s beauty, but it was us ‘Pioneers of NAU In Greece’ (a title given to us by our volcanologist professor) that were fully able to appreciate it’s uniqueness through the study of it’s past, present and future Geologic timeline. Whether it’s viewing the powerful drop-off of the submerged caldera floor through a snorkeling mask or taking a guided boat tour to the tectonically heated hot springs; our magical experiences our always tied in with our studies. 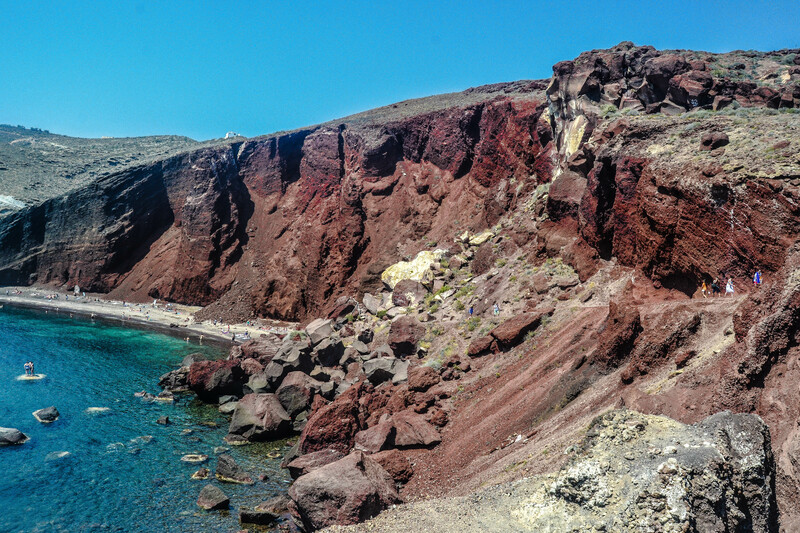 For me personally, one of the most jaw-dropping experiences was traveling to Red Beach on the southern peninsula of Thira and viewing a seemingly perfect eroded cross-section of a roughly 500,000 year old cinder cone volcano. Volcanic explosions are one of nature’s most extreme displays of power. A common and devastating result of volcanic eruptions is the fast movement of hot gas and rock that flows away from the volcano. The Greeks called them πῦρκλαστός (pronounced pyr klastós) which loosely translates to ‘broken fire’. Nuée ardente is another name used to describe these events which is French for ‘burning cloud’. In the science world today, they are referred to as pyroclastic flows.